Multivendor Marketplace App for Shopify is here with a new theme now and it would be really exciting to learn about its functions for the Admin and the Seller. 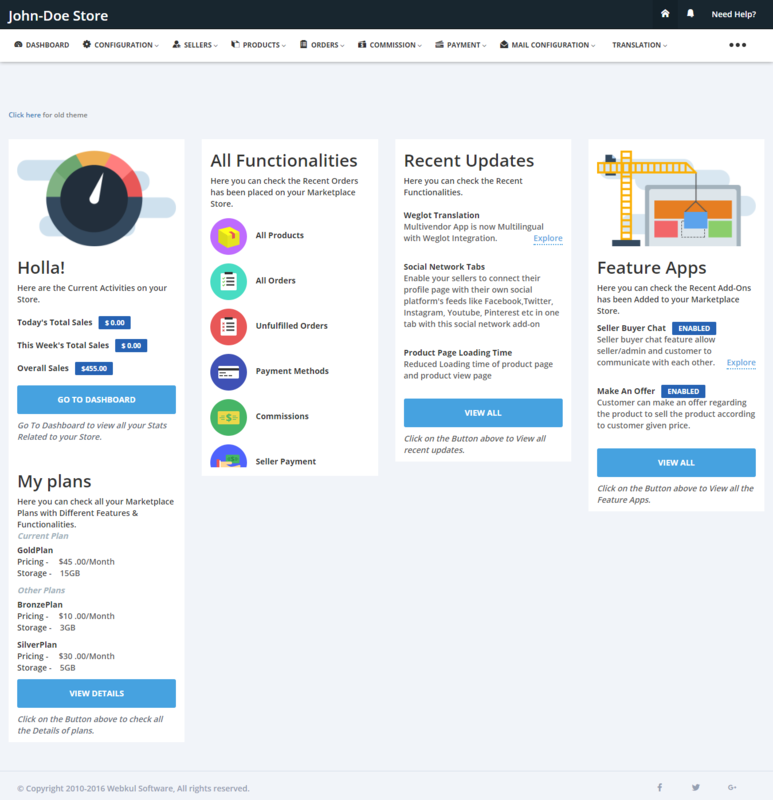 This guide will help you to understand the new theme and its functionalities. Multivendor Marketplace App is an ultimate tool to convert your store into a fully-functioning marketplace. Here, multiple sellers get registered who can sell their products locally or globally and admin can charge a commission on each seller’s earning. Firstly, let’s see how to install the Multivendor App on the Shopify Store. You can go through the Video Guide to understand how you can install the Multivendor app on your Shopify Store. Once you install the Multivendor app on your store you will be straightaway landed to the home page of the Multivendor Marketplace app. 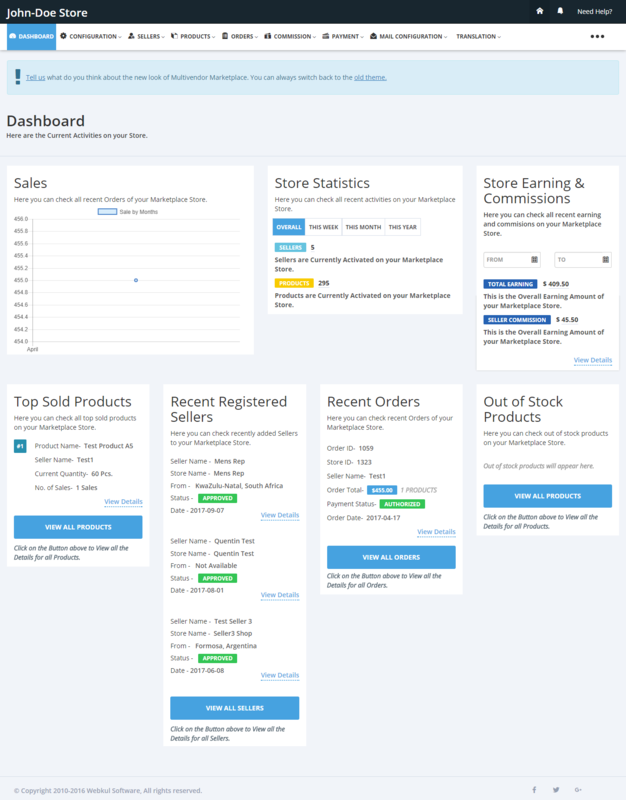 More interactive dashboard for the Admin and the Sellers both. Translation made easy for all the labels in the app. More clear and systematic menus. Seller login password can be reset by Admin. Admin can send “Order fulfillment Reminders” in bulk to the Sellers. Admin can send emails to the Sellers. Admin can now upload the default banners for all his sellers which will be visible on Seller’s profile page. Admin can now change the header and footer background color of mail templates of the app. Admin can now create the subcategories of a particular collection for product page with the help of our new feature name “Multilevel collection“. Admin can now add the staff members and assign permissions to them to manage the activities on admin panel with the help of our new feature app name “Admin staff”. Admin can also allow his sellers to add the staff to manage the activities on seller panel with the help our new feature app “Seller Staff“. Sellers can now disable their products or can sell their products (with a message display) for customers if in case he/she is not available to fulfill the orders with the help of “Seller Vacation” feature app. Both admin and Sellers can now add booking products on their end and allow more than one customer to book a slot at a time using Booking Product feature app which is now integrated with Booking App for Shopify by Webkul. Dashboard: The Admin dashboard is much more informative now. You can now check the Best Selling Product, Recent Registered Sellers, Recent Order, etc., simply by looking at the dashboard. 2. 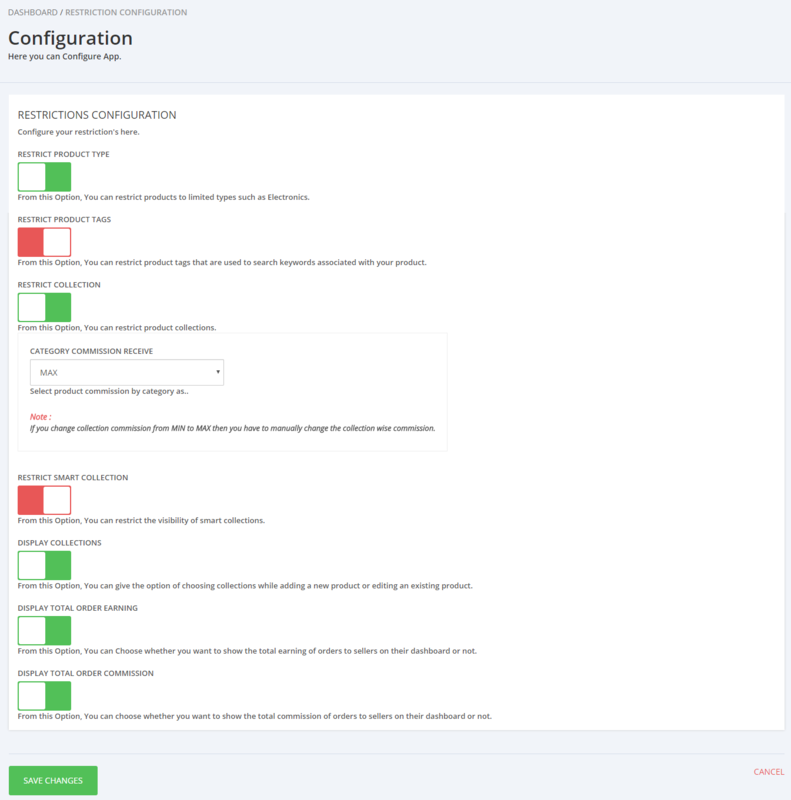 Configuration: With this, you can manage the Configuration of the App. Instruction for Marketplace– This includes all the information, which were there in the “configuration” menu before, i.e., the old theme. From here, the admin can view all the instructions provided for the configuration of the marketplace. General Configuration- This includes information related to the Admin account. From here, the admin can enter the business email, set the currency for the shop, choose the weight unit for products and much more. Product Configuration- All the Product related configuration can be done from this menu. Here, you can provide an option to add/edit/delete the products to your sellers, you can enable the option to auto-approve your products, auto-enable the added products and much more. Seller Configuration- All the Seller related configuration can be done from this menu. From here, you can allow your sellers to fulfill items, enable the option to auto-approve the added sellers, allow sellers to view customer’s details and much more. 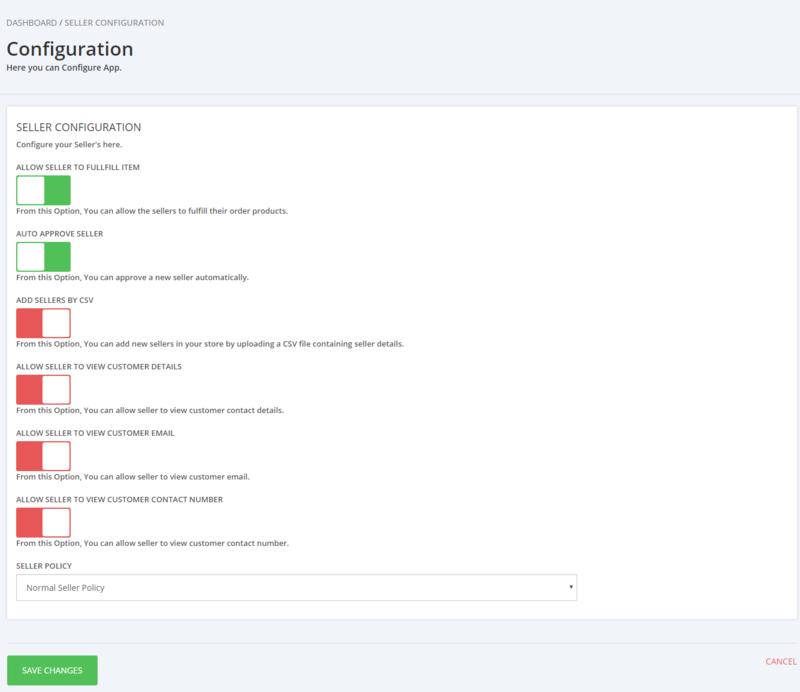 Order Configuration– All the configuration related to Orders can be done from here. You can make the “Order Shipping method” and “Order Tracking number” options mandatory. Also, you can enable the “Order Prepare Status” option to track the order preparation by the sellers and much more. Payment Configuration- Admin will set up the Payment Methods for his sellers from here and the same payment methods will be available at the seller end. You can also set the “Shipping cost” and “Taxes” the way you want to distribute these charges between you and your sellers. Restriction Configuration- You can configure all the restrictions within the app from here. You can restrict the Product Type, Product Tags to a certain limit & restrict the collections. Also, you can restrict the Product Category, Total Order Commission & Total Order Amount to be displayed on the dashboard. Custom Fields- From here, the Admin can view all the custom fields added for sellers/products and can add a new custom field. The main purpose of this is to have extra information either from the Seller or about the product being added by the Seller. This was all about the App Configuration. You can check the Video Guide to know how the admin can add sellers on the marketplace. Seller Listing: This will list all the Seller that are registered with the Multivendor App. Admin can export the Seller Details. Admin can edit/disable the seller and can also add new seller from this menu. Seller Profile Page Settings – Admin can manage all the fields that are to be shown on the Seller Profile Page. Custom CSS can also be written to change the view of the Seller Profile Page at the Shopify end. Customize Seller Page – From here Admin can manage the Seller Login Page fields, labels, logo and can also write its own JS and CSS for the page. Favicon icon upload option is provided here. Seller Policy: From this menu, the Admin can customize the Seller Policy if & only if, he has selected the seller policy to be ‘Advance Seller Policy’ from the ‘Seller Configuration’ section. This was all about the Sellers part of the Admin end. Admin can manage all the Products from this menu. 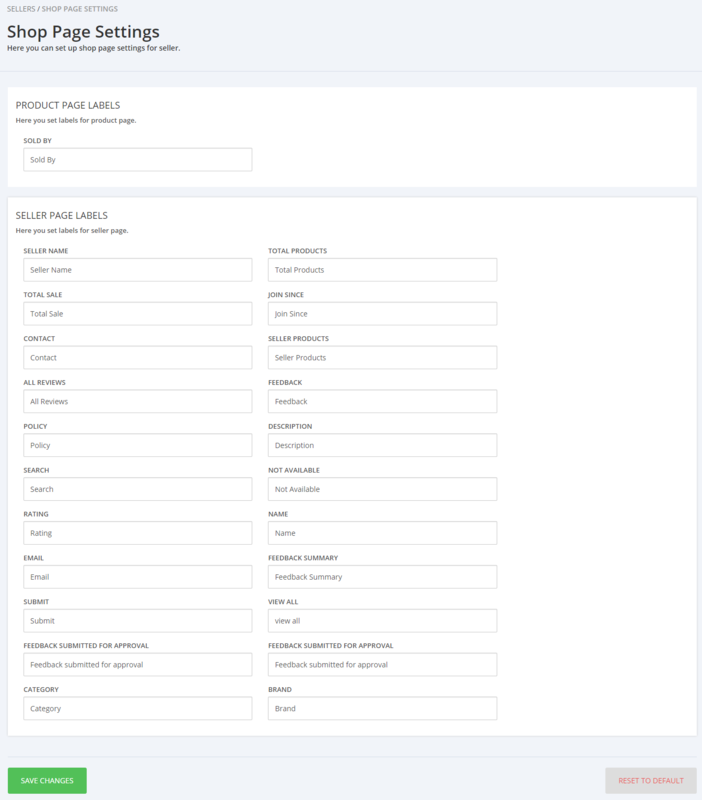 You can add Product Tags, Product Types, Collections from this section. Also, you can import your Shopify Store products into the app and assign products to sellers. You can customize the product’s form from this section of the app. Here is the Video Guide to know how the admin adds products on his end. Product Listing: Admin can view the list of all the Products added by the Sellers and can manage them easily. He can export product details, add products by CSV, edit products in bulk and much more. Product Tags: Admin can add the product tags from here and for this admin firstly needs to enable “restrict the product tags” button from the app under “restriction configuration” menu. Once done then the admin can add the tags. By this seller cannot be able to add any new tags while creating the product and will have to use the tags which are already created by you. Once done, save the changes. Please note:- The tags which are created by admin from Shopify store cannot be synced in multivendor marketplace app. Admin needs to create new product tags from this section as shown in the above screenshots. 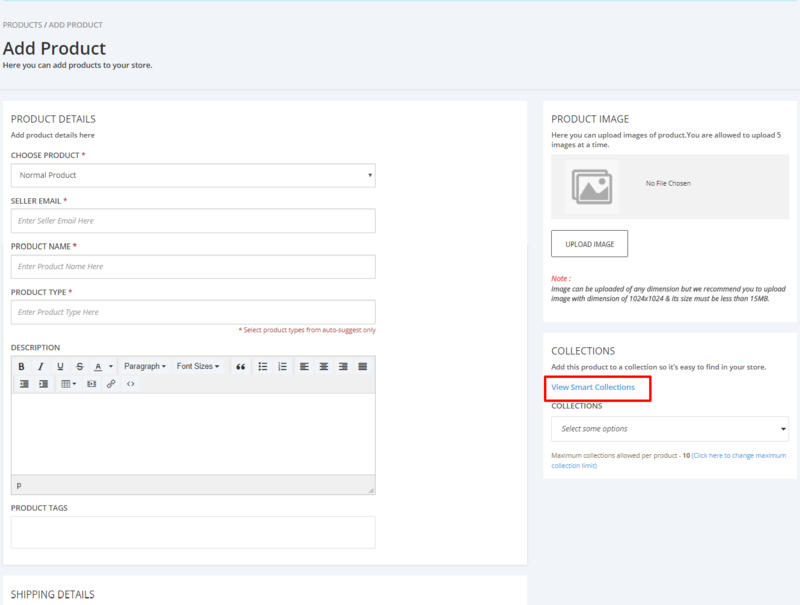 Product Types – Admin can add product types from here and for this admin needs to enable “restrict the product type” section from the app under “restriction configuration” menu. Once done then the admin can add the type to the app. By this seller cannot be able to add any new Product types while creating the product and will have to use the product types which are already created by you. Then from the collection submenu, sync the collections. This will list all your collections on the app. You can also disable the collections and those will not be visible to the seller. Import Products – If you have products added to the Shopify Store and now you want to assign them to the sellers, then you can use this option to import products into the app. Now make sure to assign these imported products to your sellers because only then the imported products will start showing on “Products Listing’ section of Multivendor app. This way you can successfully import the products from your Shopify store into multivendor marketplace app. Product Form Customization – With this Admin can manage the “Add Product Form” for normal as well as digital products in the app. Batch CSVs- This section will have the list of all the CSVs you have upload on your store till now. They can be the product, seller or any other CSV file. It can be approved/disapproved & deleted by the seller. This way you can manage the “Product” menu in the App. Admin can see the orders from here, manage invoice and can send the Reminder to the sellers for order fulfillment. Order listing – All the orders are listed and admin can send fulfill reminders to the sellers. You can go through the Video Guide to know the complete order process on the admin side. RMA Configuration – Admin can manage the status used in Return request initiation for the seller products. Admin can raise the RMA request from the “orders Listing” section of the app and same will be visible at seller end and by this seller will get the information about the order in case of cancellation/exchange/return. Invoice Settings – Admin can manage the details of the invoice sent to the sellers from here. Invoice Configuration – Admin can manage and edit the content of the invoice sent from “Admin to seller”, the invoice sent from “seller to the customer” and also “seller bulk invoice”. The menu helps in managing the invoice layout. To know about the “INVOICE” feature in detail Click here. In the Multivendor Marketplace App, Commission is the share of the admin in each seller’s earning. From this section of the app, admin can set global commission, seller-wise commission and category-wise commission. Commission Listing: The menu will list all commissions earned by the Admin for each order. Global Commission Settings: Admin can set commission for all Sellers and for all the Products applied to all Collections. Admin can specify the type of the commission and then specify the amount for the same. Seller Commission Settings: Admin can also set Commission for each seller from this menu. This is how the Admin can set up a commission for each seller. Please note that in case there is no seller commission then the global commission will be applicable to the seller. After setting this admin can have the commission based on specific collection/category. Please note that it’s applicable only to manual collections not on automated or smart collection. Here is the video guide to know how to set commissions in a much better way. Admin can manage the payments from the menu. 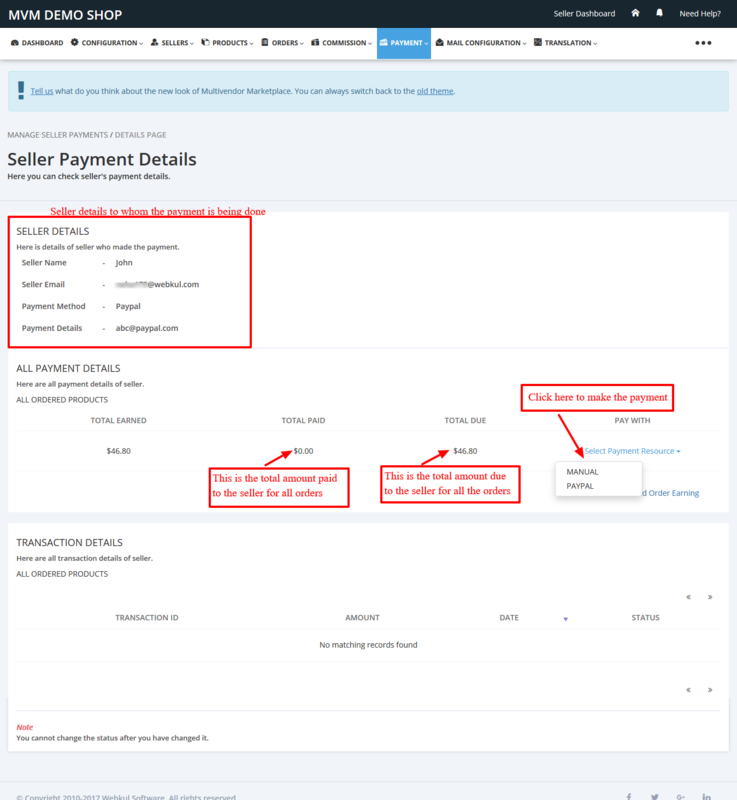 Admin can view all the Payment received from the Seller Orders and can view the Payment Methods selected by the Sellers. 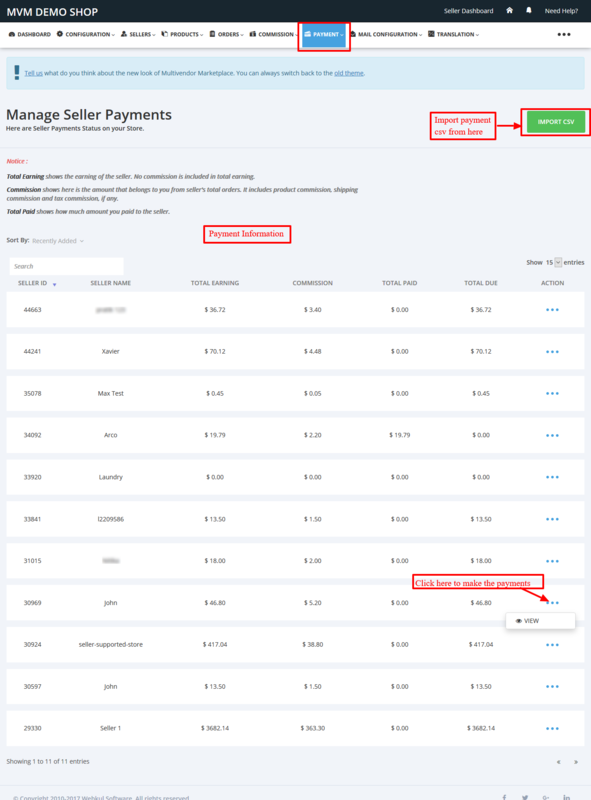 Manage Seller Payments: Admin can view all the Payment information ie. amount received (commission), seller earnings, the amount due to the seller. Admin can make the payments to the seller, using the “view” button. This way the seller is paid. We have also provided an option “manual”, so that in case you have paid the seller from other modes of payment, then you can just keep a record of the same in the app. Seller Payment Method: This will list the payment methods selected by the Sellers. 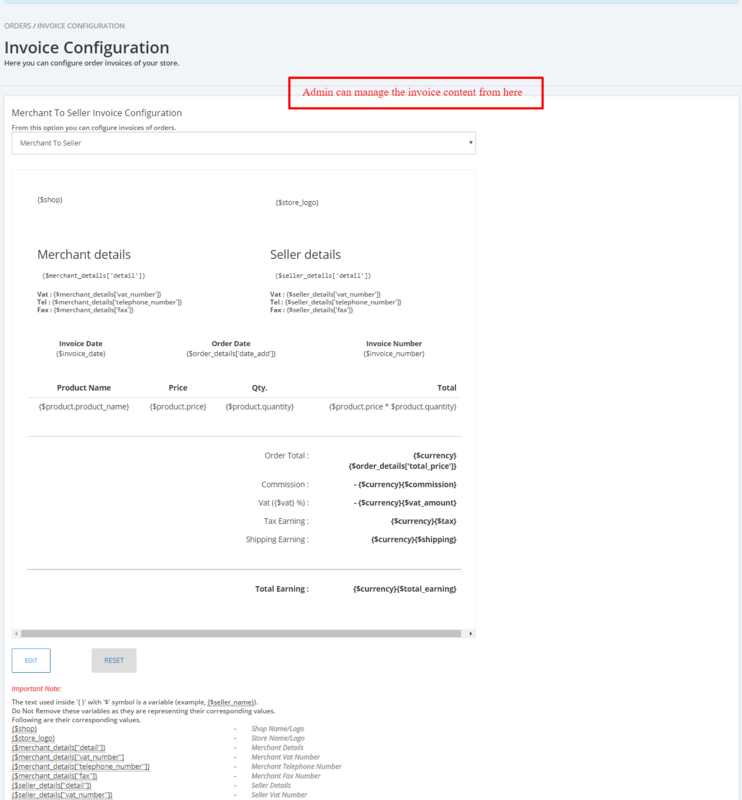 The Seller will have the option to select from the methods added by the Admin from configuration > payment configuration. 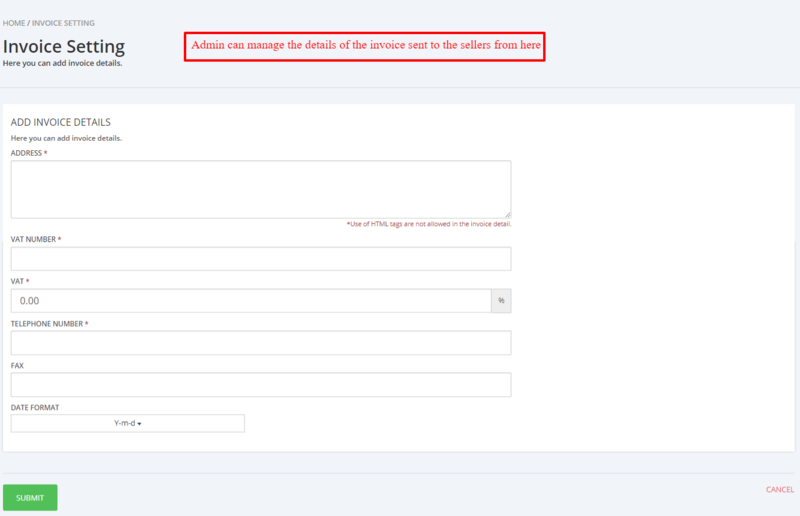 Admin can configure all the emails sent to the Sellers/Customers from the App. Admin can also set header and footer background color of mail template from here. This way admin can configure the emails easily. Mail SMTP: Admin can now have your own email in the “from” and “reply-to” section of the email sent to the sellers/vendors for the order notification, product approval, etc. Refer the user guide for the same. With the “Translation” menu, you can change the language for all the labels at the seller end, for all the menus. So, now you can get the labels changed as per your own requirement and in your choice of language. Translating labels are now easier with the help of CSV. Export label CSV of the particular page, edit and save the CSV and then import the same to see the changes. Will update more on this, so check for updates.